The cost of the kits is $14.00 for members and $15.00 for nonmembers. Plus shipping and handling of $5.00. valium. band-aids & protective eye-wear for HOF "
Last edited by Joan on Mon Feb 25, 2008 10:44 pm, edited 7 times in total. The kit is an awesome idea! I'll definitely get one in the near future because I'm horrible with shopping lists. I need to get one. I can use it for my little orphans too. I'll keep checking for shipping to be added. Tks Joan. Can I pick one up tommorrow with my baby? Sorry, Peep has them in Texas. Drat! Oh well was worth a try.... jeez Joan its a good thing you didnt have any...I was beginning to think you were perfect! Rhiannonn2626 wrote: Drat! Oh well was worth a try.... jeez Joan its a good thing you didnt have any...I was beginning to think you were perfect! She is perfect, that is why she don't have them! You going to send my check now?? By the way Joan, what all is in them? [quote="Wanda"] ... She is perfect, that is why she don't have them! You going to send my check now?? No, I'll get the tickets to the South Pacific though. Joan wrote: No, I'll get the tickets to the South Pacific though. JOAN, THAT'S A DEAL!! WHEN WE GOING?? 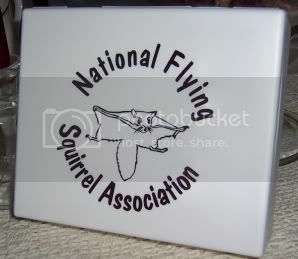 I am buying the Flying Squirrel Emergency, I am also adding a port-a-pet cage. They can be used for so many squirrel needs. The web site is www.port-a-pet-usa.com. I want to be ready for anything my baby could need. I've seen those. Let us know if your flyer chews through the screening. Anita has some really big screen travel cages and I think it was Bullet that chewed a hole in one. I know they can chew through window screening if they want to. I bought a Port-A-Pet when they first came out - Darra and I got ours at the same time. Maybe I got the only bad one that was ever made, but I finally got mad and threw it away. The zipper was put in so badly that it was next to impossible to open and close it. I didn't need to use it until long after I got it, so I couldn't return it - way too much time had passed. If you get one, check it out right away and make sure you like the way it works. I'm sure that the one that I got was just faulty - otherwise they wouldn't still be in business! So far as I know, Darra really liked, and used, hers. Thank you for the advice. We can use all we get. I will only use the port-a-pet for babies, and the emergency kit. I am trying to think of everything we could need before the baby comes. I am so anxious to get our baby. 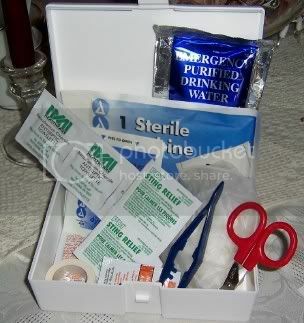 Joan, i got my first aid kits today! i cant wait to give them to my teacher, and lauren tomorrow at school! they are so cute and nifty! JesusFreakMariel wrote: Joan, i got my first aid kits today! Ooh! Now I'm excited for school! Joan - I got the decals in the mail today, they are so great! I put them in the house and told my parents about flyers drowing in toilets and put the sticker up. Send an e-mail to peep and she will get one off to you.